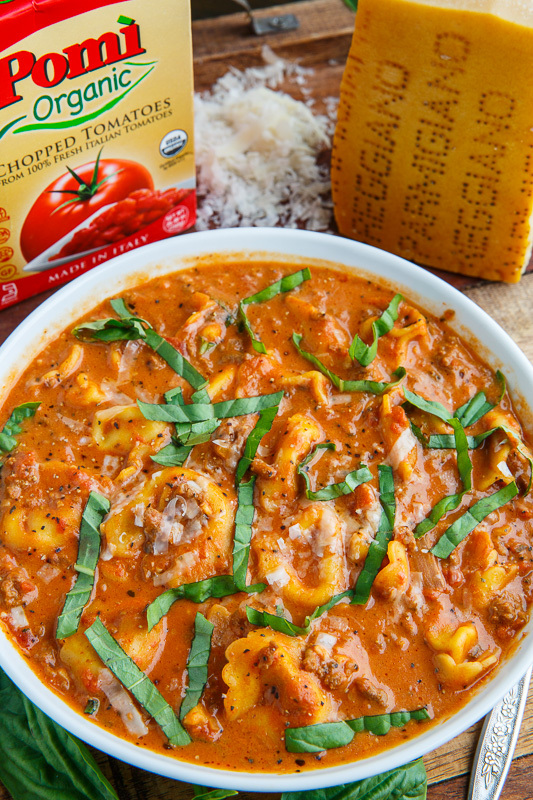 It’s been pretty chilly lately, the perfect weather for a warming bowl of beefy tortellini tomato soup using Pomì organic chopped tomatoes and tomato sauce! Pure comfort food! 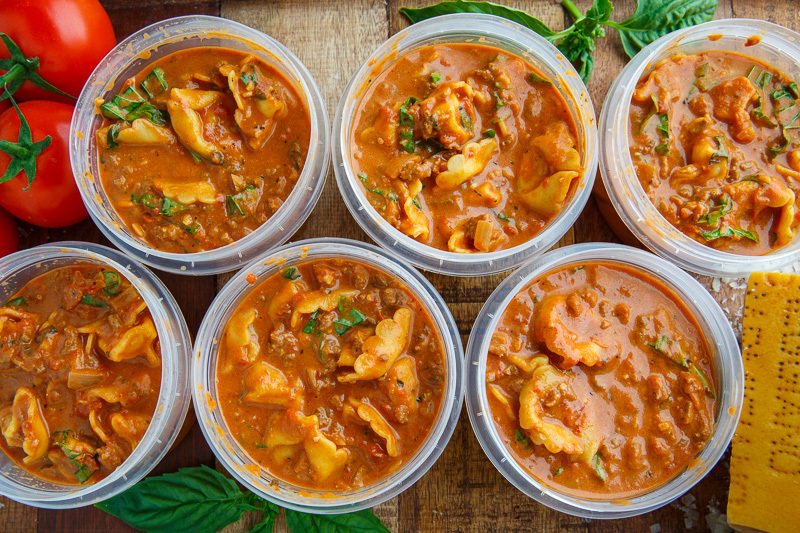 Take a look at my quick, easy and tasty beefy tortellini tomato soup recipe on Pomì! It’s perfect for meal prep on the weekend for quick and easy weekday meals! I have probably made at least 25 of your soups …. you're one of my go-to recipe sites! Love your cooking! I just made this beefy tortellini tomato soup and it's delicious! It would've been a little "smoother" to prepare had the ingredients on the Pomi site been in order of how you add them to the soup. (That seemed unusual of your recipes.) Another thought – my cream cheese was going to curdle and be hard to whisk in amongst my fragile tortellini … so I did this: I put my cream cheese & parmesan in a bowl, heated it in the microwave until warm and smooth, then I gradually added some of the soup (broth) tablespoon by tablespoon until I had a nice cheesy sauce to add to the rest of the soup. It worked beautifully! Next time I would add only 1 tsp of Iitalian herbs instead of two but that's my personal preference. 😉 Thanks! I agree with Vicky – Your site is quickly becoming my go-to recipe site! I love the creativity and obvious care that goes into coming up with, cooking, and photographing everything. Thank you! We'll be trying this one this week. It's exactly the sort of thing my family loves! What ! See the recipe ? I went to this recipe twice and it want me to add extensions and download or go to other sites. or sign up to this newsletter listed at the top of the page which I have been signed u to for years. Is this site have a nervous breakdown ? Description: A quick, easy and healthy beefy Pomì tomato soup with cheese and tortellini. 1. Cook the ground beef and onion in a large sauce pan over medium-high heat until the meat is browned and the onions are tender, about 7-10 minutes. 2. Add the garlic and red pepper flakes and cook for a minute. 3. Add the Pomì organic chopped tomatoes, Pomì tomato sauce, broth, Italian seasoning, tortellini, worcestershire sauce and balsamic vinegar, bring to a boil reduce the heat and simmer until the tortellini is cooked, about 5-7 minutes. 4. Add the cream cheese and parmesan and cook until it has melted into the soup before seasoning with salt and pepper to taste and mixing in the basil. Option: Add 1 ounce steeped and chopped dried porcini mushrooms!